Are Northerners poor because we’re thick? I spent my PhD trying to build models that would help us to develop new vaccines and drugs against malaria. Within a few months I’d become quite interested in intelligence, specifically IQ. That’s because there’s decent evidence that getting malaria as a child permanently reduces your IQ. Curing or controlling the disease might make humans smarter. I think that would be good. Discussing IQ and intelligence is difficult. Most IQ researchers are excellent and you can get a great intro to the field from one of the best young ones by reading Stuart Ritchie’s, Intelligence: All That Matters. But measured and reasonable discussions about intelligence are too often drowned out by people who reject the concept of IQ entirely shouting with people who are too eager to associate with arguments dangerously close to population control and eugenics. Europe’s history is scarred with the dreadful application of some of that thinking. As a result, researchers are very careful when making their points. Research into intelligence does not lend itself to simplicity. It is deliberately hard to understand. Nowadays I’m much more interested in the economic underperformance of North England than malaria. So it was interesting recently when my old world and new world overlapped, thanks to intelligence. Kind of. The Big Sort: Selective Migration and the Decline of Northern England, 1800-2017 uses data on the origin of surnames from as far back as 1800. You can look at the method for yourself. But what’s important is in the abstract. The paper argues that “the decline of the north is mainly explained by selective outmigration of the educated and talented”. This, they argue, “implies that policies designed to aid the population in the north in the form of regional investments, or encouragement of migration south, are likely to be ineffective in boosting outcomes for the remaining northern population”. For someone who grew up and lives in the North, and as the owner of a very Northern surname, this is a bit worrying. I grew up in the North. I live in the North. 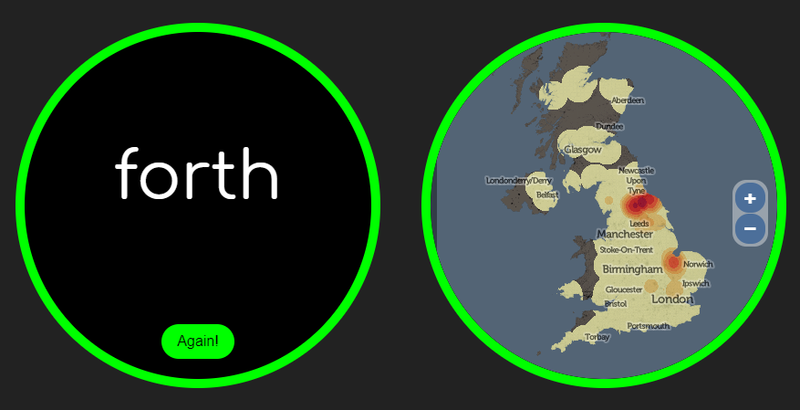 I have a Northern name. So I'm likely to have a lower IQ. The paper is long and it deliberately avoids using the word intelligence, but here’s my best guess at a blunter summary. “The most intelligent Northerners moved South over the past 200 years. As a result, Southerners are today more intelligent, and thus richer. Northerners are less intelligent, and thus poorer. Moving Northerners to the South wouldn’t help them much, they’re less intelligent and will struggle wherever they are. Investing in the North won’t help the existing population much either, Northerners are poor because they’re less intelligent, not because of low government investment or industrial decline”. It may feel insulting, but getting insulted is really unhelpful when looking at intelligence research. There is decent evidence to back up the claim in the paper. 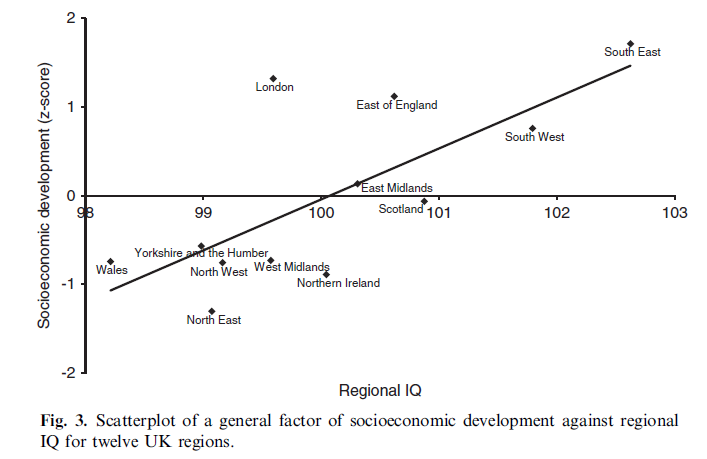 In 2016, IQ and socioeconomic development across regions of the UK, found that South England was significantly more intelligent than North England, especially when London is excluded (there are decent reasons to do this). 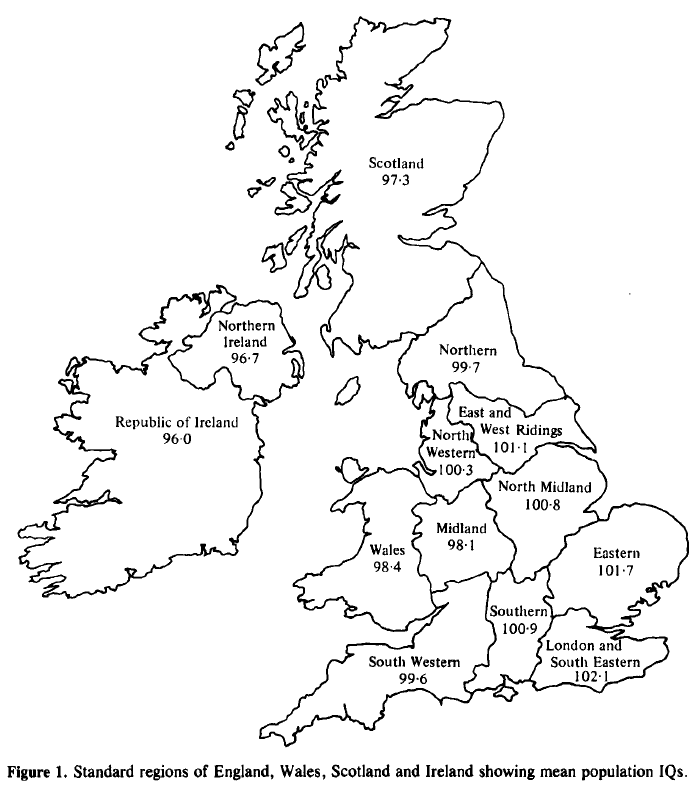 IQ by British and Irish region in 1979. But look at Ireland and Scotland and you’ll see two problems. Scotland’s economy has outperformed North England’s considerably in recent decades, and yet its IQ in Lynn 1979 was significantly lower. Is this just because of oil? Or maybe the data was wrong in 1979? (Scotland does much better on IQ in the 2016 paper). The Republic of Ireland has hugely overachieved economically in recent decades. Today its economy is stronger than the UK’s. And yet its IQ was the lowest of all measured in 1979. Migration, intelligence, and development. A long history, and a warning. At this point, I would urge you to treat Lynn with some scepticism. The Wikipedia page on him is good and well-referenced and I urge you to read it. Many intelligence researchers are wary of his work, and I wish that there were good alternatives to his papers and books. If you know of some, please leave a comment with some links. But let’s get back to intelligence and development and look at some more data. Something importantly different happened in France. France has long had very good IQ data at regional level, and good estimates of internal migration. In Le niveau intellectuel des recrues du contingent. 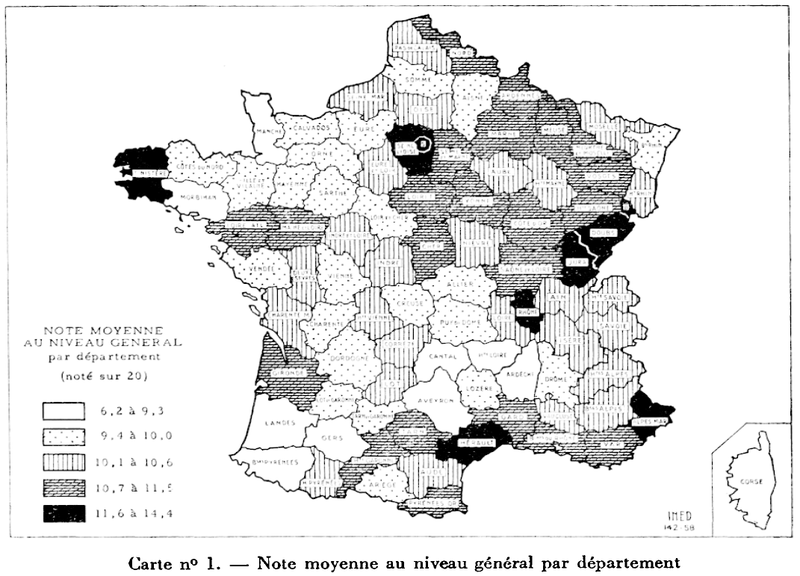 Répartition géographique pour certaines professions, 1959, Maurice De Montmollin uses fantastic data to suggest that in 1950s France, Paris and the North-East of the country had a significantly higher IQ than the South-West of France. In the 1950s, North-East and East France had higher IQ. Today they are France's poorest regions and previously low IQ West and South-West have boomed. 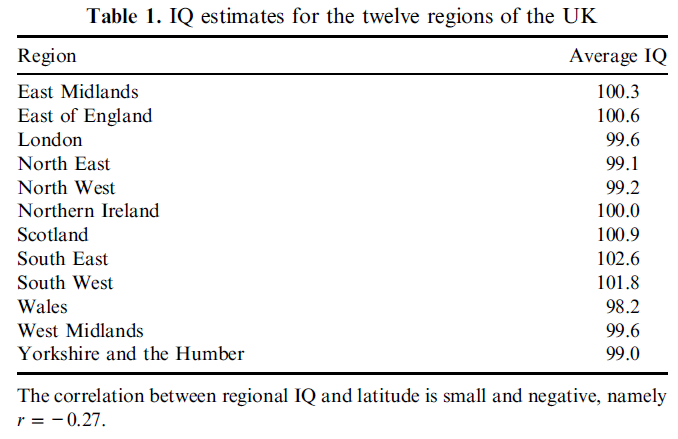 In Lynn, 1980, we see that these regions received the highest number of internal inward migrants within France, and again he argues that the higher IQ is a result of higher past inward migration, with a preference for people with higher IQ to migrate. In 1960, 1970, and even 1980 this argument was very compelling. North-East France was prosperous. But since then fortunes have changed in France. The low-IQ regions, the South-West and West of the country, have prospered. The high-IQ regions, the North-East and East have fallen behind. Intelligence was not destiny. Back to the North. What can we do? The argument in The Big Sort is not new. It has been made for decades. Some initial difference, usually a government and cultural explosion (London, Paris) or industrialisation (North-East France, North-East Spain) or a discovery (California gold) makes an area more attractive to migrants. Migrants are likely to be of higher intelligence and thus these areas acquire a more highly intelligent population, with other areas reducing in intelligence as intelligent people leave. At this stage the difference in intelligence is locked in, and efforts to improve the lives of people in left behind areas either through investment or assistance in relocation are doomed to fail. The order follows logically and The Big Sort makes the case for it between North England and South England. But I could make the same case for why South-West and West France is so much less prosperous than North-East and East France — and yet they are not. I could make the same case for why The Republic of Ireland and Scotland are so much less prosperous than North England — and yet they are not. I have not seen enough good historical regional IQ data for Britain to be convinced that the effect in The Big Sort is true. But if it is, then I see enough data from elsewhere to believe that it can be overcome. With enough investment, by building institutions locally, by retaining and attracting more well-educated and successful people, by investing in education and child welfare, I believe that North England could emulate Ireland, Scotland, Bretagne, Aquitaine, and Occitanie. The North could succeed economically despite low intelligence. Though I’d be willing to bet that as we succeeded, our IQ would rise. Intelligence is strange like that, there’s still a lot left to learn.